Previously seen in: Panama - Exile Island. Contestants, in pairs, race to a row in a gridded field, dig up a pillow, and try to get it back to their tribal mat. First tribe to three wins. Heroes win, 3 (JT, Sugar, James) to 2 (Danielle, Coach). Ep1 RC: "Battle Dig" - Heroes win, 3-2. Previously seen in: Cook Islands. 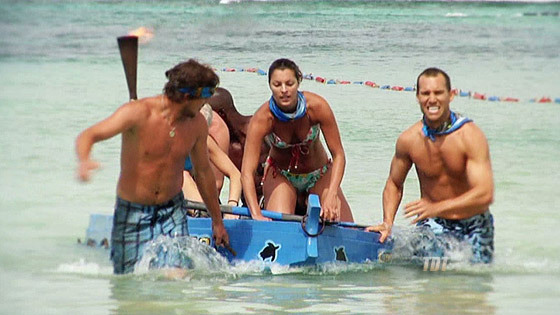 Six contestants must assemble a puzzle boat, paddle out to a wok, light a torch, and return to shore. Rungs from puzzle boat must be re-used for a ladder at the end. Remaining four players solve a compass puzzle, then the ladder puzzle, then climb the ladder to light a wok. Villains win, despite a huge Heroes lead on the paddling. Ep1 IC: "Lock & Load, Light" - Villains win. TC1 - Sugar voted out (9-1); 19 left. Boston Rob collapses in the forest, mysteriously with his shoes neatly arranged, hat on, and shirt under his head. Medical checks him, and he remains in the game. Boston Rob collapses, returns to game after medical visit. Previously seen in: Tocantins. Randy & Courtney sit out for Villains, Rupert for Heroes. In pairs, tribes must take turns rolling six heavy crates back to the starting platform, then assemble a staircase puzzle using the crates. Villains win. Ep2 RC/IC: "A Crate Idea" - Villains win immunity, tarp, rope, nails. TC2 - Stephenie voted out (6-3); 18 left. Ep3 RC/IC: "Sumo'an Mud" - Heroes win, 8-0. TC3 - Randy voted out (9-1); 17 left. Ep4 RC: "Slip, Slide & Score" - Villains win more building supplies. Ep4 IC: "Roll With It" - Villains win. TC4 -Cirie idoled out (3--2); 16 left. Ep5 RC: "Schmergen Brawl" - Villains win chocolate feast at To Sua ocean trench. TC5 - Tom voted out (5-2); 15 left. Ep6 RC/IC: "Rope-A-Dope" - Rob & Candice (& Rob) win. TC6 - Tyson idoled out (-3-2); 14 left. TC7 - James voted out (5-1); 13 left. Ep7 RC: "Basket Brawl" - Heroes win waterfall feast. Ep7 IC: "Caught in the Web" - Heroes win. TC8 - Rob voted out (4-3-1); 12 left. Ep8 RC: "Fauxconut Bowling" - Heroes win another feast. Ep8 IC: "Mudslide" - Heroes win. TC9 - Coach voted out (4-3, first juror); 11 left. Ep9 RC: "Chimney Sweep" - Villains win Outback Steak House reward. Parvati gets idol clue. 6.7 earthquake circa 3 a.m.
Ep9 IC: "Strung Out" - Heroes win. JT passes idol to Colby, to Russell. TC10 - Courtney voted out (5-1); 10 left. Tribes merge, Yin-Yang formed. Minor feast-in-a-box. 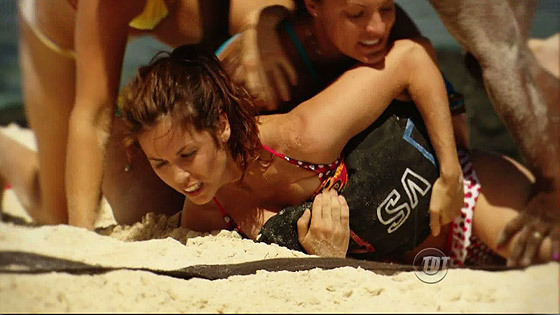 Ep10 IC: "Get a Grip" - Danielle wins. TC11 - JT idoled out (-5); 9 left. Ep11 RC: "Pacific Shuffle" - Amanda, Colby, Danielle win trip to RL Stevenson house. Ep11 IC: "House of Cards" - Jerri wins. TC12 - Amanda voted out (6-3); 8 left. Ep12 IC1: "When It Rains" - Parvati wins. TC13 - Candice voted out (5-3); 7 left. Ep12 IC2: "Pegatory Knockout" - Russell wins. TC14 - Danielle voted out (4-3); 6 left. Ep13 IC: "Keep It Up" - Parvati wins. Ep14 IC1: "Offer It Up" - Parvati wins. Ep14 F4 IC: "Blind Maze" - Russell wins.